I'll preface this post by saying that this is the best salad I've made in a long time. (Maybe ever.) It's an amalgamation of two different recipes from my cooking spirit guide, Heidi Swanson. I'd been putting off buying a mortar and pestle, as I thought it was an unnecessary kitchen tool, but now that I've seen the magic it's capable of making (read: this dressing), I realize it was a smart purchase. If you don't have one, a food processor will work just fine. In a mortar and pestle, smash garlic, chile flakes and salt into a paste. Add oil, scallions and basil and continue to smash. Transfer the mixture to a mason jar and whisk in coconut milk and lemon juice. Taste and add more salt or lemon juice as needed. Store dressing in refrigerator for up to one week. Rinse and pick over lentils. In a large pot, combine lentils and water and bring to a gentle simmer. Simmer for 20-25 minutes, with the lid cracked open a bit. After they are fully cooked, strain out any remaining water. In a salad bowl, start with a base layer of lettuce. Next, add cooked lentils and thinly sliced avocado quarters. 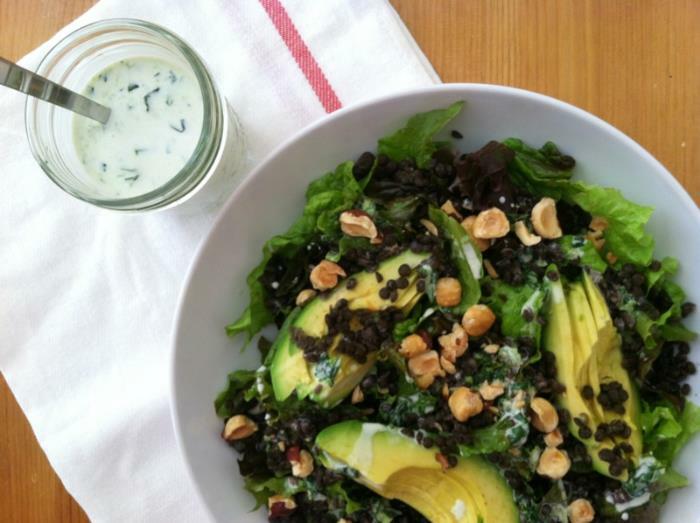 Top it off with the chopped hazelnuts and the coconut milk dressing.